The 87th Geneva Motor Show is now on, it officially began today. We expect to hear and see quite a bit about intelligent automobiles, self driving cars, advanced in-car computers, and other uses of new technology in the auto industry. Many people will be mindful of their car tyres; they form the road/rubber interface that you need to look after carefully for safe motoring. However, would you go as far as looking for and installing smart tyres? Pirelli hopes so as it launched its Connesso system for intelligent tyres. 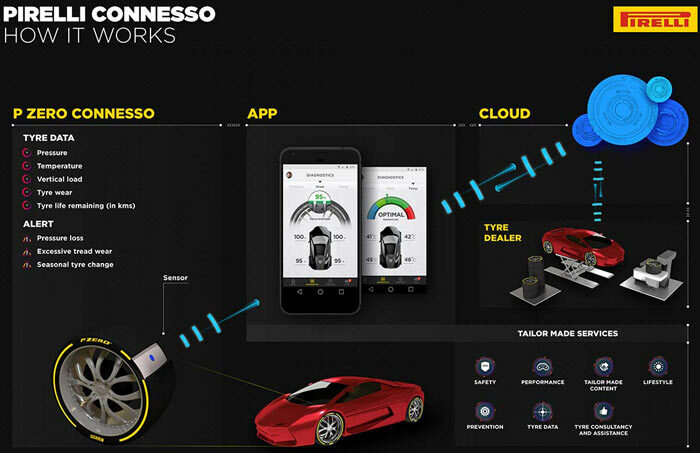 Pirelli Connesso is a platform that ties together smart tyre sensors, a cloud system, and mobile app. The system works thanks to a sensor embedded into the inner wall of various Pirelli tyre models. Pirelli's sensor is capable of monitoring and feeding back information regarding pressure, temperature, and load data to a receiver unit in the car. From there the data is shared via the cloud with your smart device. Calculations can be made to estimate tyre travel distance, wear and so on. Data can be used by the platform to show more information on the car's on-board computer screen too. Useful alerts can be generated by Conesso if your tyre pressures are too low or when wear limits are nearing. The app can direct you to the nearest workshop for tyre replacement, but is more useful to pre-book a tyre change ahead of it being required. App functionality will expand later, with Connesso community data such as motorsport events nearby provided to users. If you want new tyres with this smart functionality you will be looking at the new P Zero and Winter Sottozero ranges from Pirelli. It is said that the tyre-based sensors have no effect on the actual tyre performance. The new smart tyre ranges will be made available in non-fading red, yellow, white and silver side accent colours and are pre-orderable now. Can see these costing an arm and leg. Is that a cloud arm and a leg? Yeah but they will probably only cost a lot at first. I love this idea, as long as they are able to recycle, or even better reuse, the sensors. Of course no way would any data be used by relevant authorities to track ones movements and monitor ones speed, i mean who would be interested in that? Conspiracy theoriees incoming! Seriously though, looks like an interesting way to make traction control systems even more accurate. I wonder whether they'll do the same for motorcycle tyres.